When timing test sets in OnDeck, there are two ways to handle when a swimmer passes another in a lane, referred to as the passing mode. 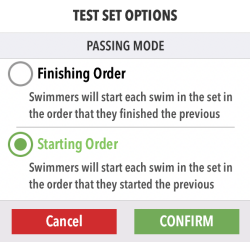 Before you start timing a test set, tap the gear icon in the upper right to change the passing mode. Make your selection, CONFIRM. Starting Order is the default. If a swimmer passes another, in the next leg of the swim they will resume their original starting order. With Finishing Order, if a swimmer passes another, in the next leg of the swim they will continue in that order.